I know inside Knott's there's tons of food options. That said, when it's a slow day at the park, they don't all open. And when all of a sudden you realized you're hungry, your choice is to go get Chinese junk food or wait in line for the Log Ride, you decided to get food. 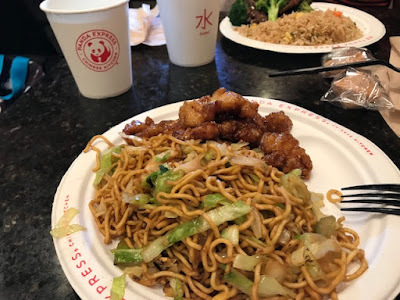 Yep, who knew that there's a Panda Express in the middle of the Knott's Berry Farm? Me neither! But there it was. They are quite interesting, there's nothing theme tied to the restaurant, just there in the middle. Next to the Corn Dog and fries stand in front of the log ride's line.